Give Tonight's Chicken Dinner A Little Flavor! Your family will soon realize that when you say that you are preparing a chicken dish for dinner, that could mean a whole range of yummy options! As with most cooking experiences, you are limited only by your imagination. Here is a guideline for what spices are known for the flavor they bring to chicken dishes. First of all - opt for fresh herbs whenever possible. 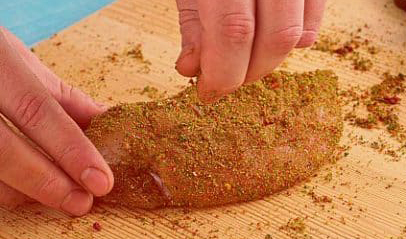 They will be more flavorful over dried herbs every time! Likewise, if you can freshly grind any whole spices right before adding them to your recipes, you will find they will taste better. But, if you do not have access to fresh or whole herbs, then by all means, use dried herbs. Adding some flavor is better than adding none! These herbs and seasonings are a great place to start, but don't hesitate to experiment a bit. Remember to write down the combinations of any spices you use! It would be a shame to have a dish that is just AMAZING, and then realize you don't know how to duplicate it!! Are you working on developing a healthy diet? Well, certainly the main component is choosing the right foods. But did you know that “how” you cook foods can have a huge impact also? Now that grilling season is upon us, there is reason to celebrate the health benefits of cooking your food on the grill rather than on the stove or in the oven. You eat less fat because the excess fat drips off the grates while cooking. Think about it - when you grill a burger on the grill, the fat cooks off. When you cook that same burger on a cooktop, the fat has nowhere to go and tends to be re-absorbed by the meat. 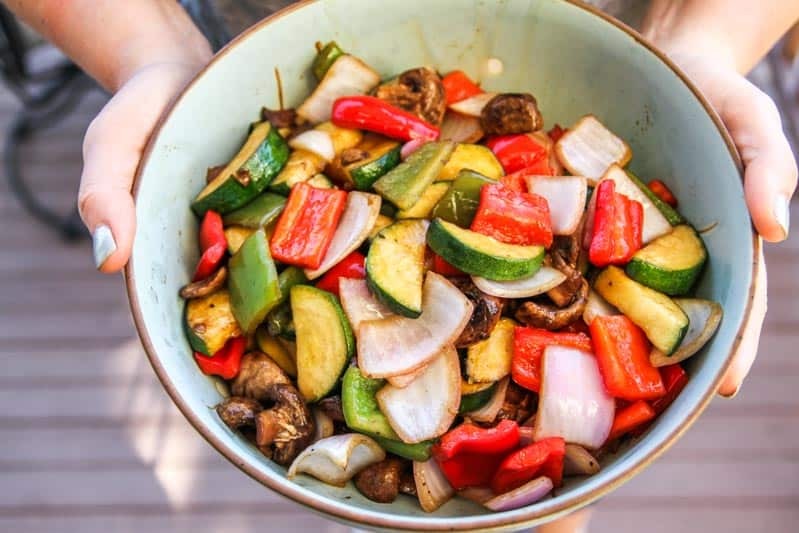 When grilling veggies, they retain more of their vitamins and minerals when grilled. Wrapping in foil or even just placing them directly on the grill can be nutritionally advantageous over frying or boiling. When meat is cooked over a fire, it preserves more riboflavin and thiamine, key nutrients in a healthy diet. Because grilled foods generally lock in more moisture, you will be less likely to reach for butter or other condiments, some of which can be very high calorie. You grill outdoors!! Being outdoors encourages activity – even if you are tossing a ball or throwing a frisbee while you are cooking…. An added bonus! Know how long to cook your particular veggie. Some take a minute or two to cook while others take longer. Denser vegetables, such as potatoes, will take the longest. Don’t use too-high heat for too long or they will become charred on the outside while staying raw on the inside. For best results and to prevent burning, sear vegetables over high heat, then move them to a cooler part of the grill to finish cooking. Or - precook them and just give them a few minutes on the grill to get some color on the outside. Remember that you can use a grill basket or skewer for smaller veggies that might roll around or fall through the grate. Don’t have a grill basket? Create one by folding a 2-foot long piece of heavy duty foil in half and crimp the ends-voila! Tuscan-Style Roasted Asparagus - Good Hot or Cold! Preheat oven to 400°. 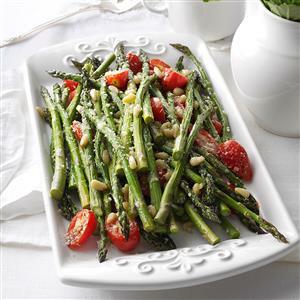 Place the asparagus, tomatoes and pine nuts on a foil-lined 15x10x1-in. baking pan. Mix 2 tablespoons oil, garlic, salt and pepper; add to asparagus and toss to coat. Bake 15-20 minutes or just until asparagus is tender. Drizzle with remaining oil and the lemon juice; sprinkle with cheese and lemon peel. Toss to combine. One of the best ways to add a little variety into your meals is to include produce that is currently in season! If you are trying something new - it will be at its most flavorful, plentiful (and hopefully that means more cost-effective). Periodically, I will be posting under a Seasonal Eatings headline. When you see that header, you will know that I am lifting up a particular ingredient that is in season (or near in season -- this blog has readers all over the country and so in season in one area may be a little "less" in season in others). But, you get the point! So, let's talk asparagus!! Why would I want to eat asparagus? Asparagus nutrition has impressive nutritioonal value because it contains virtually no fat and remains very low in calories, with only 20 calories for five spears, yet asparagus is packed with vitamins and minerals. Most notably, asparagust is high in Vitamin K, acts as a natural diuretic and is high in fiber. What to look for when buying asparagus: Look for firm but tender stalks with good color and closed tips. Smaller, thinner stalks are not necessarily more tender. Actually, thicker stalks are often better due to the smaller ratio of skin to volume. Cooking for a side dish can be quick and easy: Wash in cold water and remove the bottom ends of the stalks (if the asparagus is fresh, the bottoms should snap off cleanly). It can be cooked in a pan with water, lemon and olive oil; it can be grilled over medium heat; it can be roasted in the oven or even cooked in the microwave if you are short on time. Do you feel more comfortable with an actual recipe? Well, here you go! "Snack" doesn't have to be a bad word! The word “snacking” has developed a bad reputation – many of us immediately think of high-calorie chips, processed foods, and cookies. But actually, “snacking” means eating between meals, whether the food is healthy or not. Studies have shown that the main motivation for in-between-meal eating is hunger, but other factors like stress, location, and social environment can play a big role too. Before you reach for that snack (good or bad), take a moment and think: Am I really hungry right now? Or is something else going on? But, let’s be real; there WILL be times when you will reach for that snack. Plan ahead so that reaching for a healthy snack will be just as easy as reaching out for that processed package of chips or cookies.